Super Rugby Round 11 was the one where some demarcation appeared in the top half of the table. With the Chiefs prevailing over the Force, and the Bulls and Highlanders both losing, an eight-point gap has suddenly emerged between the Chiefs in fourth place, and the chasing pack of five teams all within a win of each other. It was also the round where the Brumbies avenged some up-and-down recent form, while in Cape Town, we may very well have witnessed the Stormers and Bulls play out the game of the year, despite only one try being scored. If something does top it as a spectacle over the last seven rounds, it's going to be sight to behold. Here were a few things that stood out in Round 11. How do we read the Chiefs? The loss of Aaron Cruden for the season means there will be a natural curiosity around the Chiefs for the remaining seven rounds of Super Rugby. Marty McKenzie was a more than capable replacement in the no.10 jersey, and the Chiefs really didn't miss a beat in accounting for the Force 35-27. Yes, the Force came back strongly in the last half an hour of the game - and a man down for the last 50 minutes of the game at that - but ultimately the class of the Chiefs prevailed. But how much of that is a 'dead cat bounce' and how much is it down to their superior systems? Realistically, there was no pressure on McKenzie in this match, and if the Chiefs had failed to hold off the fast-finishing Force, the narrative around the loss would have been around McKenzie chalking one up to experience. That the Chiefs won, McKenzie gets due credit for his efforts in sparking the first-half attacking raids, but the rest of the side also wins plaudits for taking the pressure off their rookie No.10. So the question then becomes one of how long can the Chiefs keep this up? If we know one thing about the Chiefs and Dave Rennie, it's that the whole organisation must be prepared to play their role and beyond, so that there is no chance of over-reliance on any one piece in the puzzle. The Chiefs face the Rebels in Melbourne this Saturday night, but then have the bye before heading to Wellington to face the rampant Hurricanes in Round 14. The Rebels have nothing to lose now, and the Hurricanes fear no-one in 2015. This next stretch is where the Chiefs' systems will face their true test. After stringing together their first consecutive wins under Tony McGahan, the Rebels were left to rue the one that got away in Sydney on Saturday night. Even tougher to take will be the reality that the Rebels have now dropped off that mid-table group of teams, and now find themselves stuck in 11th, and a bonus point win off the Crusaders in 9th. Especially tough to take given the second-half fightback, too. 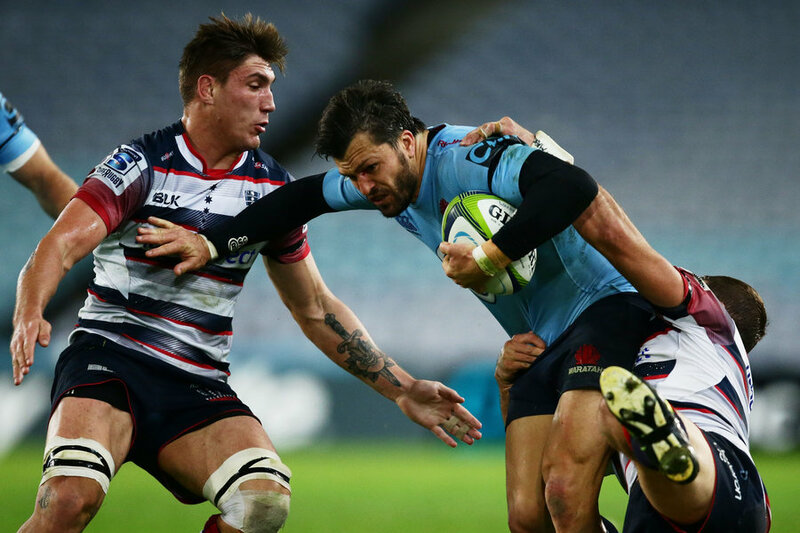 Jack Debreczini's booming goal kicking had brought the Rebels back to within a try of the Waratahs, and it felt like they had all the momentum in what had become the same sort of wet weather game they dominated in Canberra the week before. Then came the crucial mistake from referee Rohan Hoffman in the 59th minute, where he was literally caught out and confused by the line markings at ANZ Stadium. The wet weather in Sydney on Saturday meant that the NRL line markings from the Friday night hadn't been completely removed, nor were the rugby line markings properly standing out. It was an understandable error from Hoffmann, but you do have to wonder why in this day and age of endless stoppages, why in those moments before the lineout Hoffmann couldn't have quickly called time off and had TMO George Ayoub confirm where the ruck was. Fans on social media and rugby forums even suggested that Ayoub could be heard on Sports Ears telling Hoffmann before the lineout that the ruck was inside the 22m line. 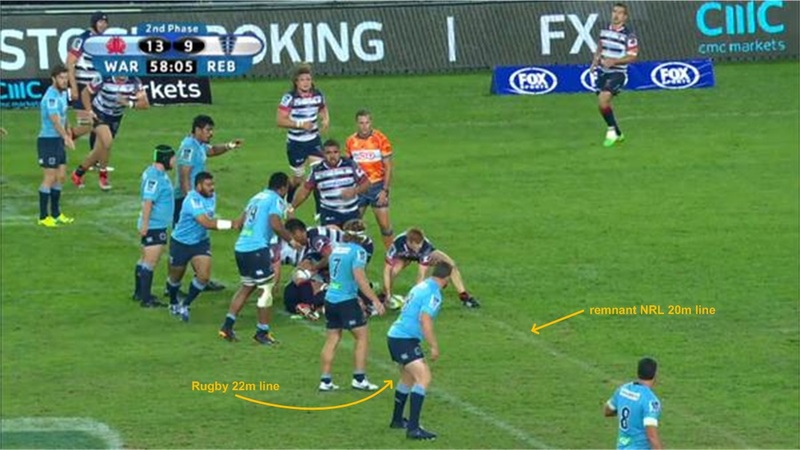 It's a long bow to say that that decision cost the Rebels the game, but you do have to wonder how at the game might have played out from 13-9 after the Waratahs' lineout was conducted back in their own half, rather than inside the Rebels' 22. All the momentum was with the Rebels at that point, too. Instead, Rob Horne scored from the 'Tahs lineout, and they went out to an 18-9 lead. So having being caught between the lines in Sydney, the Rebels face an even bigger task in the form of the Chiefs this Saturday night. A win at home would mean so much to this side after a really impressive and increasing vein of form over the last few weeks. In the same game in Sydney, the Waratahs pulled out to a 13-0 lead over the Rebels with one of the best set-play tries of the year. From an attacking lineout near the Rebels' 40m line, the Waratahs went to the right, with inside-centre Kurtley Beale drifting wide, and with outside-centre Adam Ashley-Cooper and fullback Israel Folau outside him. Flanker Michael Hooper loomed behind that trio. The split image above shows it playing out. In the first image, we see Folau cutting back to the left as Beale (12) approaches Rebels inside-centre Mitch Inman in front of him. Rebels outside-centre Tamati Ellison has already changed direction to track inwards on Folau. In the second image, Ellison has gone with Folau into contact, and Rebels winger Sefanaia Naivalu is caught flat-footed in deciding whether to cover Hooper, who is about to take the second-man pass from Beale, or whether to go to his left with Ashley-Cooper (13). In the end, he missed both of them, and Hooper (7) streamed through the massive gap before linking up with Ashley-Cooper, who ran around to score behind the posts. It's a great set play, and one that could cause similar issues for the new Brumbies centre combination of Robbie Coleman and Tevita Kuridrani. Though Coleman wears No.12 and attacks in the inside-centre channel, outside-centre Kuridrani defended in the central corridor last weekend against the Highlanders, and indeed, was the major reason why Shaun Treeby saw so little ball from fly-half Lima Sopoaga. If the Waratahs can find themselves in a similar attacking position, this set-play could very easily take advantage of Coleman defending in the wider channel, given that he spent the first nine games of the season at fullback. If a seasoned defender like Ellison can get caught up by Folau's angle, there's every chance Coleman could be similarly hoodwinked. Add to that Henry Speight's want to rush infield in similar situations, and even if the gap is not there for Hooper, another short ball would almost certainly put Ashley-Cooper into space on the outside. Keep an eye out for it on Friday night in what shapes as a massive game for the Australian conference title.